With the recent uptick we’ve seen in the popularity of Carbon-Ti’s road hubs (especially in our custom wheel program), we wanted to share some of our impressions. Before delving into the specifics, first off we’d like to state that these X-Hub Road SP hubs are proving to be robust and reliable. Our wheelbuilders love the quick and simple axle removal process, a necessary step in lacing any straight pull hub. As part of the wheel lacing process, removing and reinstalling the axle can add a significant amount of time, and some other manufacturers don’t seem to consider this problem in their hub designs. 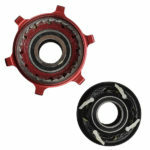 Additionally, the freehub body swaps are about as easy as it gets – all plug-and-play with no proprietary tools. Lastly, the preload adjustements (or BPS – Bearing Preload System) on both front and rear hubs feature a simple, user-friendly design – much quicker and easier to use than most other manufacturers’ designs. 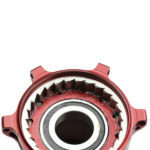 In fact, many other high-end hubs don’t even offer a method for adjusting out the play in their bearings. Drive Mechanism: 4 pawls. Titanium drive ring. Weight: At 60 grams (front) and 159 grams (rear), these are not the absolute lightest hubs on the market, but they’re definitely in the top of their class. The trick, however, is not only making a hub light, but making it so that it can be both light/durable, and reliable enough to withstand normal daily use. Our experiences with these hubs over the last year has convinced us these are the lightest hubs that we’d consider to be reliable and durable enough for most daily riders. Drive Mechanism: These use a tried-and-true traditional pawl and drive ring system, but last year received an update moving them from a 3 -pawl to a 4-pawl design. This allows for multiple pawls to engage for a more secure engagement. Drillings: 20/24 hole only. This is an area where we’d like to see some expansion and have been talking to Carbon-ti about just such a thing. 20/24 is great for many riders and many rims, but with lower profile rims and or heavier riders a higher spoke count would be preferred. It is worth noting that the lower spoke count can be somewhat compensated for with a thicker gauge spoke. 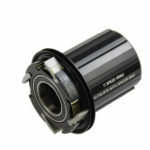 Freehub bodies: Available in Shimano, Sram road, Campagnolo and Sram XD. Wheelbuilding dimensions: This is an area of particular interest for us as we think things such as bracing angle and tension ratios are some of the most important characteristics when it comes to spec’ing a custom wheel build. We know it’s not as fun to talk about as other aspects such as weight, colors etc… but it’s a critical factor in getting the right wheel build for a given set of circumstances. The Carbon-Ti hubs really do match some of the best in this area. Front bracing angle is 8.3 degrees which makes it the widest of any hub we’ve previously reviewed. Rear Bracing angle is 7.8 degrees non drive side and 3.6 degrees drive side. That puts it almost at the top in terms of rear bracing angle with only two others with a wider position. Though the Carbon Ti with it’s 48% tension ratio moves to the top of the field when considering both tension ration and bracing angles simultaneously. Straight pull spokes: About the straight pull spokes: the advantage in our opinion is mainly aesthetic – if you like the look, that is as good a reason as any. Traditionally, straight pull spokes have been considered stronger because they lack a bend at the head, but with modern materials a properly built wheel shouldn’t really see any meaningful real world differences between straight-pull and j-bend. The same might not be said of differences in SP and JB flanges. SP flange failures, while not impossible, do seem to happen less often. (This is anecdotal at best and may simply have to do with the volume of Jbend hubs in the world vs SP hubs.) We’ve been impressed with the hubs enough that we’ve decided to expand our SP spoke selection to include Sapim CX Rays (light gauge bladed spokes) in black and silver, CX Sprints (heavier gauge bladed) in black, and Race (heavier gauge butted round) in black. These are in stock in all lengths from 240-310mm, plus we also have access to others, including a few light and exotic choices like Sapim CX Supers. 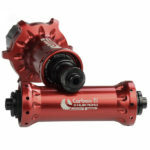 Overall: The value of the hubset at $119 and $299 beats a lot of high-end competitors by a long ways, and the pair’s 219g weight is world class. Those two factors on their own make this a hubset to pay attention to. However when mixed with a really stellar preload adjustment, full size 17mm axle, color choices, and really top shelf wheel building dimensions this hub quickly becomes a top contender for many builds. Why do some hubs need to have pre-load adjustment? In my experience, all with such have been nothing but trouble – Zipp, Easton. The good ones with no adjustment have lasted me 50,000+ miles with zero bearing problems. 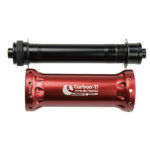 Thanks for the excellent review, showing the advantages of the Carbon Ti hubs. What lightweight rim would you advice to build a strong climbing wheelset ? Bought a custom set of Easton wheels with these hubs and i really like it. Light, fast engagement and reliable so far. The only drawback of these hubs is that they really loud when freewheeling. Any suggestions to minimize this loud noise? 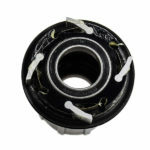 We were able to significantly reduce the noise of the Carbon-Ti freehub using DT Swiss Star Ratchet Grease. Other lightweight greases such as Slick Honey should also work well.